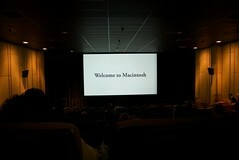 I watched the documentary film “Welcome to Macintosh” and I liked it. I know… you’re like “No duh! Mr. Fanboi, of course you loved it!” but hey, I’ve got issues with Apple, and they do plenty of things I don’t like (they always have) but using computers created by Apple has been a part of my life for 30 years now… I don’t think there is a brand around I’ve been involved with for that long… well, been involved with, and haven’t grown to hate. One thing I feel wasn’t really touched on is that in the past few years Macs (and other Apple products) have become “lifestyle” items, where in the past I don’t think this was the case. The film did mention that in the mid-to-late 1990′s it was hard to be a Mac user. Damn straight it was… I was deep into it. I worked at a design firm/publishing company where we had tons of Macs, and seeing the unknown future of the Mac (and Apple!) back then was not easy. By the end of the lifecycle of Mac OS 9 (pre-OS X) I was almost ready to abandon the Mac. I was using FreeBSD as a server OS, and Windows was making in-roads and actually getting better… If the NeXT/Apple thing hadn’t happened, and Mac OS X hadn’t come along, things would have been dismal. Looking back today, it’s easy to say that Steve Jobs and Mac OS X were the saviors of Apple… and I don’t know how much my design background plays into it, but I really do want to use beautiful, well designed things, and that’s where Apple shines, and in true Apple sense, design refers to how things work, and how they function on the inside, just as much as they refer to how things look on the outside. So my recommendation of the film is, if you’ve used/liked/loved the Mac for 10 years or more, see it. You’ll find it fun, amusing, and informative. If you admire Apple as a brand, see it, as there’s some valuable insight into design and marketing that the Microsofts of the world will never get right. If you’re a die-hard Microsoft lover or Windows user… or hey, a Linux/open source dude… it may not interest you quite as much. Posted on Saturday, November 14th, 2009 at 11:24 pm. Subscribe to the comments feed. Both comments and pings are currently closed. Post on your own blog.